You are currently browsing the archive for the baking category. This post is really, really, really late. I’m sorry. Yeah, I know. Lisa and I baked this like a month ago but LISTEN, I’ve been BUSY so LEAVE ME ALONE. Plus, this baking endeavor was really tiring and it kind of made me hate every recipe that called for some cutesy twist, which led to my current stagnant bitterness over anything heart or baking related. Unfortunately, this has not affected the amount of baked goods I consume every week. Back to the Giant Baking. Since Lisa and I have officially run out of ideas (or HAD….wait until you see what we’ve got in store next *cue dramatic music*), we decided to continue with the theme of baking-things-inside-of-things. 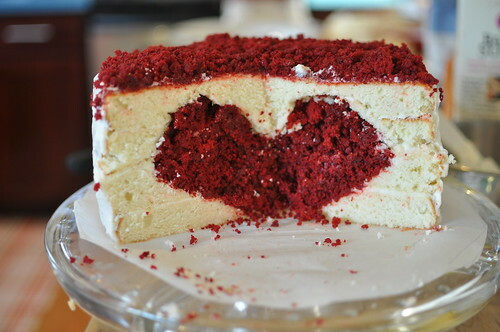 We weren’t pleased with how the Oreo stuffed chocolate chip cookies turned out, but what about a heart shaped cake baked inside a regular cake? OMG SO CUTE. Yeah, that’s now how we felt about a third of the way through. We’re renaming this recipe was “stupid cake” because of the insane number of steps, the errors in the recipes we used (people, there’s a big difference between baking soda and baking powder so please don’t confuse the two), the number of times we actually had to touch the cakes (and I have this weird thing where I don’t really like to touch food unless it’s putting a donut in my mouth) and the fact that we had to put parts of this cake in the freezer a billion times. Seriously. If your recipe calls for putting parts of the final product inside the freezer, it is not longer considered “baking.” It is called “freezing” and therefore, should be relegated to hobbies that involve like making popsicles, ice cream or storing dead bodies. Okay, I’ll stop complaining. Let’s go. Lisa and I have a problem: we are out of giant things to bake. There are only so many times we can make giant cookie cakes and cupcakes, and there are only so many times we can fork over our hard earned cash to buy giant baking molds. So we thought we’d take a different approach by baking things-inside-of-things, kind of like this pumpkin pie in a cupcake–which sounds really labor intensive for a Saturday afternoon–so we decided to give this Oreo Stuffed Chocolate Chip Cookie recipe a hand. We baked a buttermilk pie over the weekend. That’s a lie. B did. I did nothing. I didn’t even make the pie crust. We weren’t sure how it was going to turn out, so we bought frozen pie crust instead. Pie gods, please don’t be too angry with me. This was a trial run. Next time, we’ll use nice crust. I mean, next next time since we have one more frozen crust to use because apparently they only sell them in pairs. How many times can I say crust in one blog post? 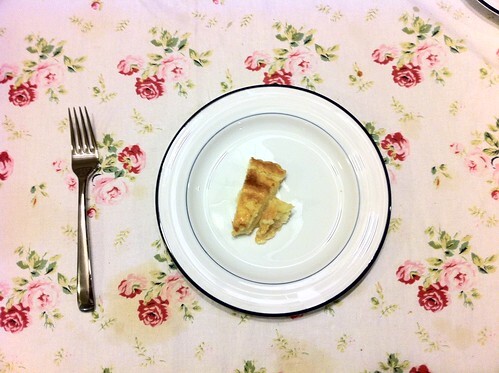 And yes, that is a VERY small slice of pie. I asked for a “little bit” which in my language means “not enormous” but apparently other people interpret that differently. What happens when you visit your in-laws for a lovely week in Sonoma County and then they force you to slave away making Christmas yummies? Okay, that was a joke but with the holiday celebrations come the annual baking of sugar cookies and caramels. The latter happened the day we arrived, but somehow they turned out super sticky so Alicia and I got really tired of trying to cut, roll and wrap bite sized pieces in wax paper. So we cheated and made one ginormous piece, which we hid at the bottom of the bowl. To be honest, this enormous piece also had pieces of foil stuck to it (that’s how sticky it was!) so it’s not like we were expecting anyone to actually eat it. 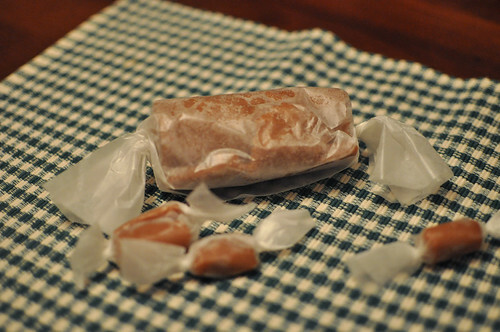 Homemade caramels are so delicious. Someone needs to invent a caramel flavored salt lick so I can slobber all over it every day. I’d have one for my desk and another in the car, and maybe one on the kitchen counter while I tried to cook. Donut Day is January 10th! It’s true! January 10th, 2011 is officially Donut Day, which marks the end of the year long bet to not eat a delicious donut for 365 days. That’s only four weeks away but the victory is so close that I can taste it (and it tastes like a yummy freshly fried maple bar). I’m already planning a celebration at my desk (since Donut Day falls on a Monday) where I’ll just sit and eat a dozen donuts (or at least until I throw up). I can’t wait. It will be glorious. Why did I succumb to this stupid bet? One idea was for health reasons, but honestly, not being able to eat a donut meant just eating more slices of cheesecake and pie. I mean, come on. Having donuts in or out of my life had no affect on how much sugar I consumed every day. I heart sugar. The other idea was to save money but who am I kidding? Donuts are like the cheapest (and most delicious) treats available. They’re like 50 cents, which is way cheaper than crying into a pint of Ben & Jerry’s ice cream. Seriously. Do the math. Another idea was for the prize, which we decided earlier, would be a fun trip (which could even count as our real “honeymoon” since we never took one in the first place) but now that we have a mortgage, I think it’s better to shelf that plan. So what was the point? I’m not sure. Penance for some unknown sin so I could suffer through the worst year of my life? * I mean, it was pretty ridiculous. I had to sit through a whole tasting menu at the one and only French Laundry without being able to order Thomas Keller’s famous coffee-and-donut trio, I couldn’t savor the freshly made glazed donuts if we went to Tom Colicchio’s Craft Restaurant and I wasn’t even about to sample Wolfgang Puck’s chocolate donut holes with peanut butter at the company holiday party last night. So basically, I’m an idiot. Thank you. If you’d like to be invited to my donut celebrations, just shoot me an email and I’ll figure something out. Donuts for everyone! *Worst in terms of being able to enjoy a donut. Sometimes I come across videos online that I feel like sum up my life in some weird parallel universe way. For example, this weekend, I decided to bake a cheesecake for the very first time. We picked a pumpkin flavor with a graham cracker/gingersnap crust, wasted time trying to find a good springform pan (which I accidentally called a springboard pan…which is actually pretty cool. Maybe it launches your baked goods into the air after it cools?) and the whole time, I was telling B how much I loved Japanese cheesecakes (rare cheesecakes) because they are less sweet. Also, B set up his little squirrel collection today on our new bookshelves, which I was tempted to throw out. [Sidenote: Before I fell asleep, I learned that cream cheese was inadvertently invented when some American dairy guy tried to make French Neufchatel cheese, and that it’s also known as farmer’s cheese, which explains SO MUCH because we’ve been eating farmer’s cheese from the GastroBus and never figured out what it was.] And what do I find today? Some Japanese lady feeding her pet squirrel a rare cheesecake. WAT? I know. It’s like everything from this past weekend combined into a single video. Tomorrow, I hope to find a video about coffee tables, Triscuit crackers and baby sloths. Those are the things on my mind right now. Anyway. As always, life gets a little crazy and hectic. The next thing Lisa and I know, it’s suddenly October and we haven’t baked yet! 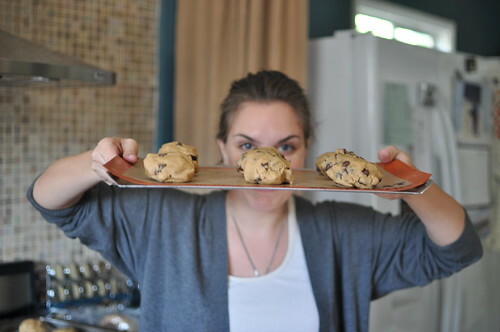 This time, we decided to create something seasonal and economical by using pureed pumpkins and ye old cookie cake pans. Back in July, we baked the amazing peanut butter and jelly cakewich but let’s be honest, we’re kind of running out of giant baking ideas and it’s not like we want to keep spending money on more baking molds. 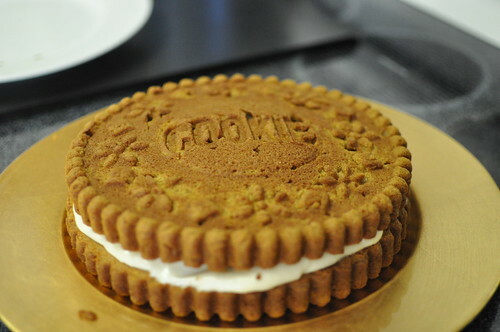 So meet the Pumpkin Spice Cookie Cake Sandwich with Cream Cheese Icing! So, Lisa and I haven’t had any Giant Baking Adventures lately, but it’s mostly her fault. I mean, I’ve been a little busy with various things in my life that I can’t really recall right now, but she’s such a social butterfly with so much going on that it’s hard to find a time or a place to bake. That’s all a lie. We’re kind of out of ideas of giant things to bake. We still have a giant cinnamon bun to bake, but having to wait for the dough to rise and all that makes things complicated. But then I saw this PUMPKIN PIE IN A CUPCAKE and we were like, OMG WE HAVE TO MAKE THIS. Pie in a cupcake whaaaat? *brain explodes* Why not make a Giant Pumpkin Pie in a Cupcake, since we already have a giant cupcake pan AND my amazing culinary pie skills to begin with? So let’s do this. How? I have no idea. Let me tell you a funny story. 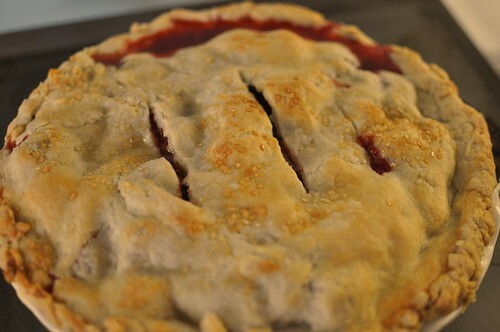 One morning, I woke up from a horrible nightmare where B and I decided to bake a pie for our friends and their kiddies for a dinner party, but for some reason, we decided to bake it that night at their place. We didn’t bring any of the right utensils or ingredients, so the pie making was going nowhere. We even put egg in the dough, though I have no idea why. Meanwhile, our friends were patiently waiting for the pie to be ready while the food was getting cold and their kids were crying from hunger. It was really awful. So I woke up, went to work and told my friend all about it, which led us to talk about how we should really bake a pie with their kids in real life to a) prove that dreams don’t come true and b) prove how fun baking a pie with awesome kids can be. And that’s exactly what we did. Well, we baked a pie with one kid who is my favoritest four year old in the world because his little brother is still only a wee baby and though he can hold his head up, I doubt he’d be able to handle a rolling pin.